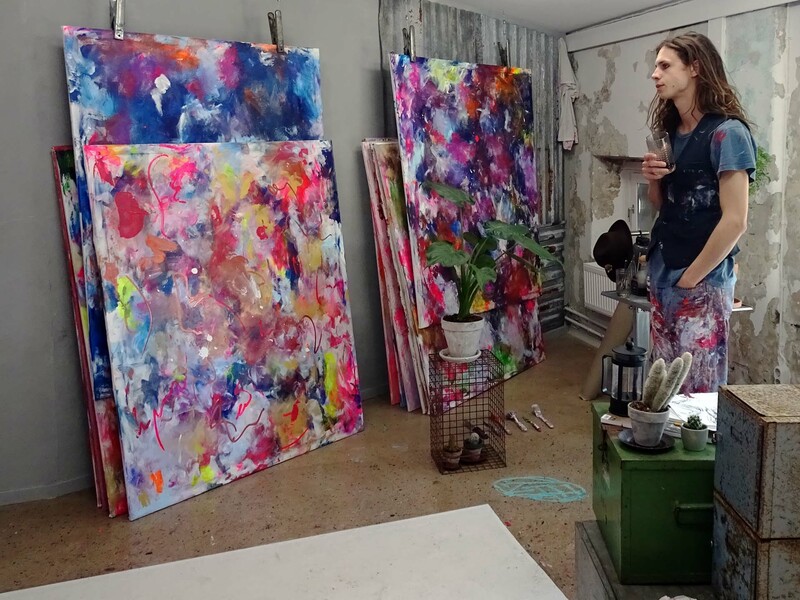 There is something very attractive about artists’ studios. 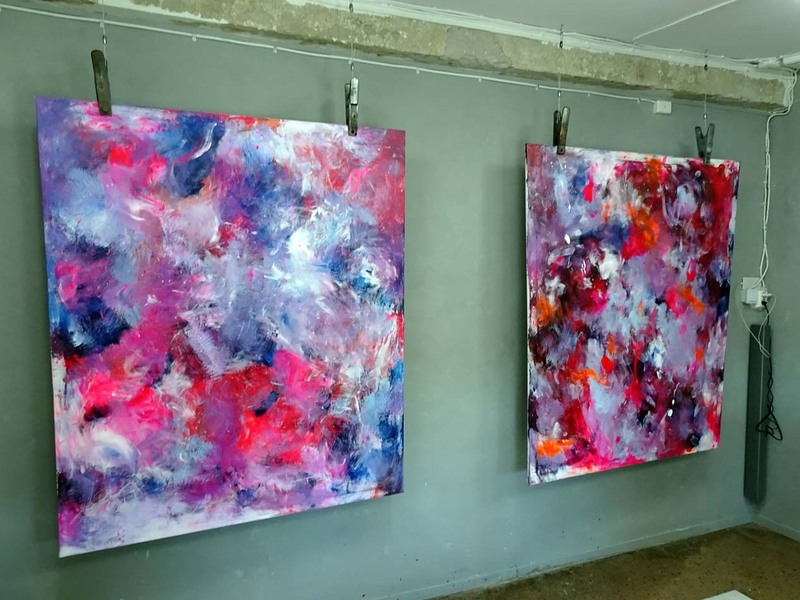 When you are yourself not a professional artist, when you’re an amateur – or perhaps not even that – you can have a romantic attraction to the life of the artist. You imagine yourself with your own studio. The rough, paint-spattered floor, the shelves of found objects, the smell of oils and inks, pencils and paper. You have a vision of yourself, camping out in your garret, arguing and creating alongside other artists, dropping acid or absinth, taking up with artists’ models, contracting Bohemian tuberculosis and dying romantically. (After first slicing off an ear in demonstration of your van Goghery). Perhaps you dream of escaping to Mexico or the South Pacific to paint lush orchids or Polynesian madonnas. Or you imagine yourself, perhaps, in your chateau, painting monumental water lilies. Or under the warm sun of Cannes or California, making iconic art, idolised by the rich and famous. On Sunday afternoon I took myself across the river and out to Röda sten konsthallen (RSK) – the Red Stone Art Gallery. The gallery is housed in a former power station. (Like the Tate Modern in London – which it predates by about 5 years – but on a smaller scale.) 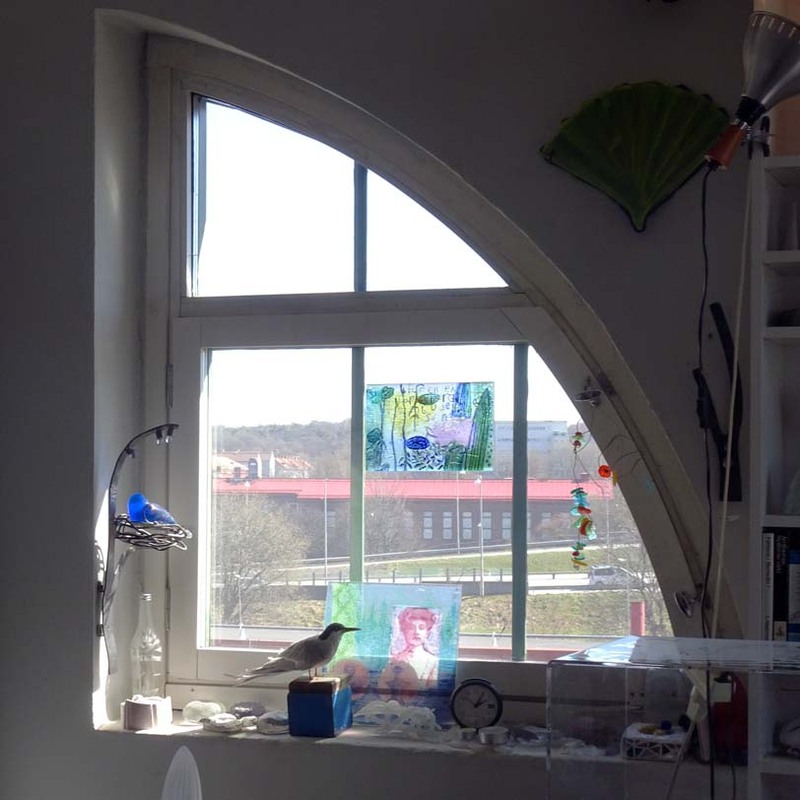 The district of Gothenburg where the gallery stands is Majorna, and Majorna has what must be the highest concentration of artists’ studios of any area of the city. 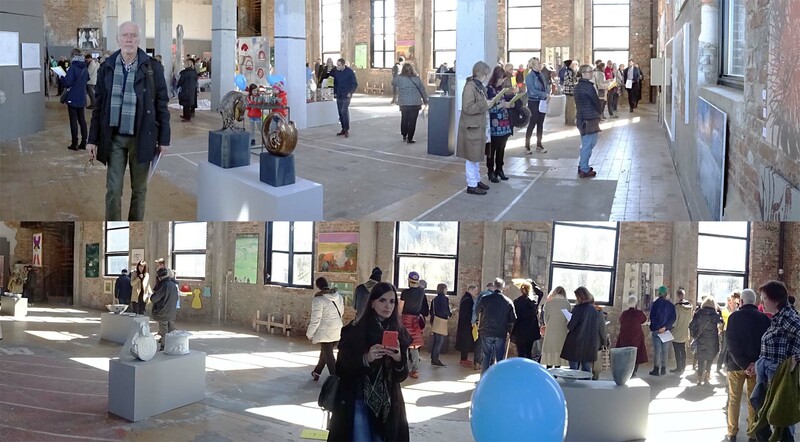 Every year, late in April, Majorna district artists get together to run konstrundan i Majorna (KIM) – the art round in Majorna. This year’s KIM was the 20th. The KIM exhibition at RSK has become a regular feature in my life. When I’m home in Gothenburg at the right time, I try to take myself out there to visit the gallery exhibition. This year I thought I would try to get around to some of the studios as well. In the event I ended up with just a couple of hours available on the Sunday, the last day of KIM. So I went to the exhibition as usual and was tempted, once again, to ignore the studios. But – for all the reasons in the first paragraphs above – the attraction was too great. 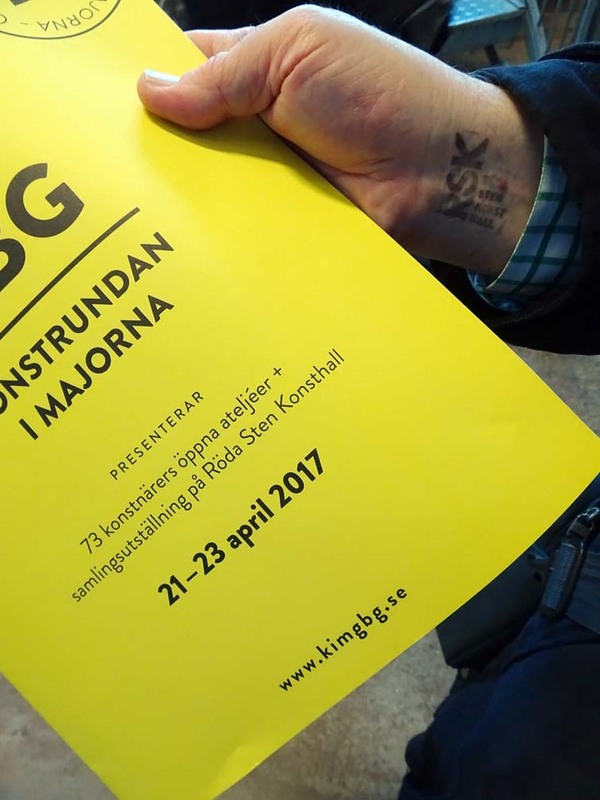 The KIM catalogue, picked up at Röda sten, included a map of Majorna with all the galleries marked. The closest galleries were in Sockerbruket, so that’s where I went. Röda sten lies towards the sea on the southern shore of the Göta river. 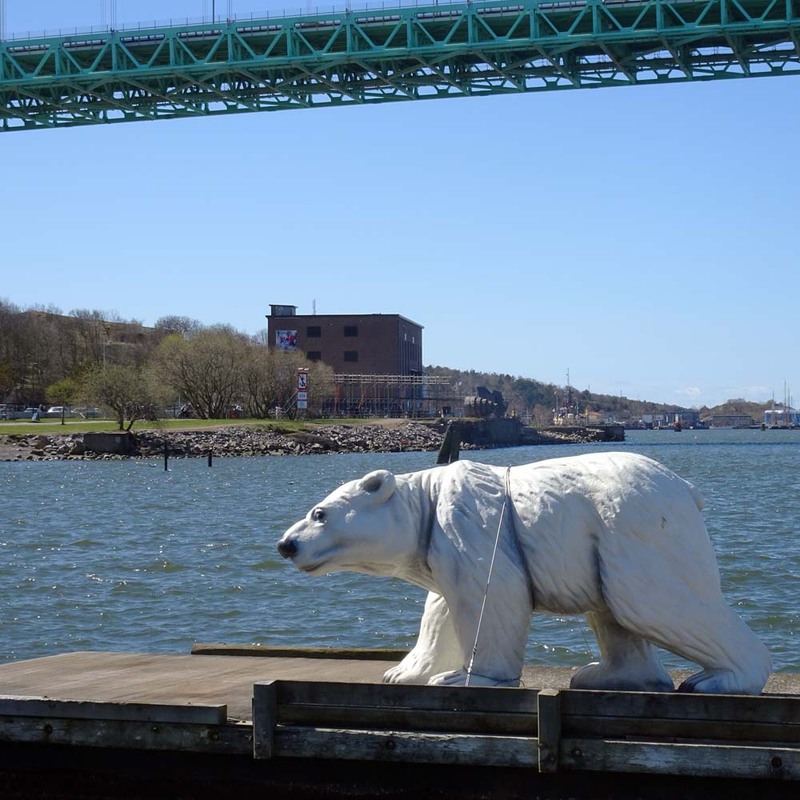 It’s in the shadow of the Älvsborg suspension bridge – Gothenburg’s Golden Gate. Across some wasteland under the bridge, towards the city, is a complex of 19th century industrial buildings. 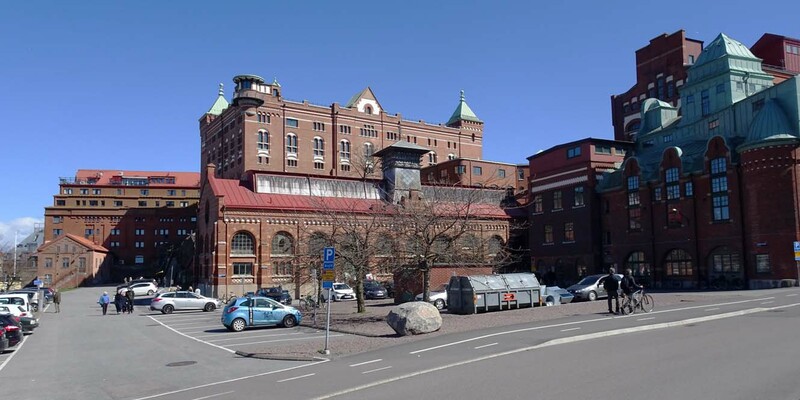 These include a former porter brewery and a factory where sugar was refined – Sockerbruket. Nowadays much of this industrial space has been colonised by artists. I have visited Sockerbruket before. I even once considered hiring office space there. But this was the first time I was able to go inside several of the rooms. In fact, I ended up visiting eight studios. 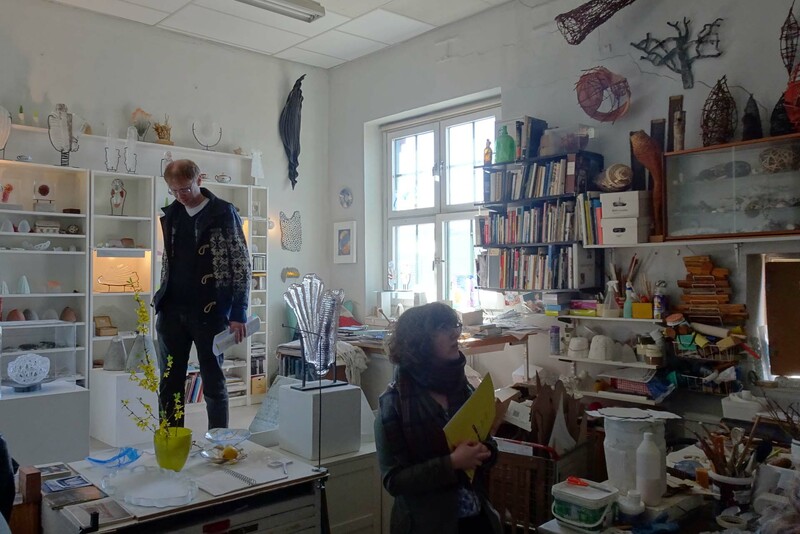 One thing that struck me was how many of the artists’ studios were pokey and dark. I suppose if you need a space to work and you are economically limited this must be the best solution. (Though renting office space at Sockerbruket certainly isn’t cheap.) I’ve always thought an artist would need good light to work by, so it was a surprise. Of course, the light must vary during the day and through the year and it’s not impossible that I was seeing the studios at the wrong time. Still, the light was too poor for me to want to try taking photos until I climbed all the way to the top of the building. Here at last there were a couple of studios with decent light. So I asked permission and was able to take a few pictures. Anna Eggert (@bluesjellyfish on Instagram) works in various ways with glass (and other materials). 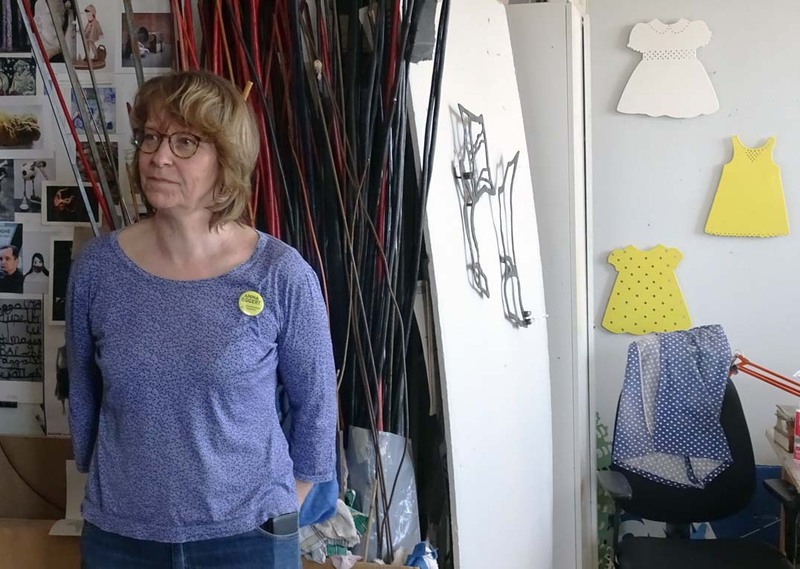 If you look around her studio you see sculptures, panels and mosaics. In the next studio, one floor further up, I found this young man who told me he is “working under the name DIVE” on his current project called Madhouse. These two artists will have to stand as my only examples of the range of art to be found in Majorna. Next year – maybe – I’ll plan my time better and use all three days of KIM to get around to a greater variety of studios and see more. It’s inspiring to meet artists surrounded by their work and talk with them about their art. And one day, who knows, I might be able to afford to buy something I like. In the meantime, these photos give me a little more fuel for my pipe dreams. Jag hade ingen aning om att det fanns konstrunda även i Göteborg, trodde att vi var ensamma om det i Skåne. Detta får jag tipsa dottern om! Det finns fler Eva! I Bohuslän och Halland finns dem också, men då behöver man bil. Har besökt Röda Stenen och sett konstutställningen där för många år sedan. Det var en upplevelse. Tack för ett mycket intressant inlägg.